Creating unique campaigns that capture your prospect's imaginations requires constant innovation and a little bit of inspiration, too! From microsites to podcasts to webinars, these seven examples demonstrate how to infuse creativity into every part of your digital marketing campaigns, while driving engagement and conversions. Yes, I want to receive Salesforce communications by email. 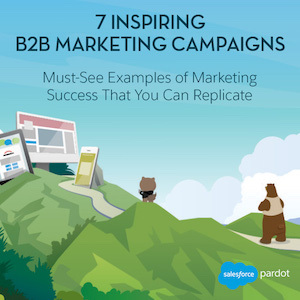 Pardot, B2B marketing automation by Salesforce, offers an easy-to-use marketing automation solution that allows marketing and sales departments to create, deploy, and manage online marketing campaigns from one central platform. Together, Pardot and Salesforce empower every rep to act in the moment of engagement, and every marketer to drive greater results from campaigns.